Few things annoy and trouble gardeners as much as weeds. These invasive, and quick-growing pests can quickly consume the nutrients in your soil and choke the life out of your turf and garden. Although to adequately combat this resilient foe, I had to thoroughly learn about weeds, their different types, and kinds, as well as some tips to prevent them from growing. Prevention, of course, is always better than a cure. You’ll find all of what I’ve learned here. 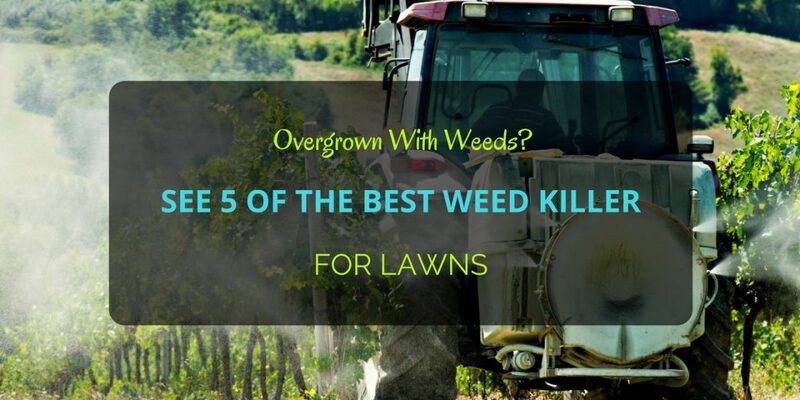 However, if your lawn is now overgrown, and there’s now more weed than turf, then you might benefit from using one or two of the best weed killer forlawns. I’ve tested and reviewed 5 of this potent herbicides so you can bid weeds a quick farewell. Also, I’ve included some helpful tips safety measures when you decide to use these products. Without further ado, let’s start with a quick look at the top 5 best weed killer for lawns. One of the most important things I learned about weeds and weed control is this: weed killers should not be your first resort. Weed killers, or herbicides, are ultimately toxins and applying them on the first sign of trouble can be risky for the living things in your yard or garden that you want to protect. Additionally, I learned that weeds are a symptom of an unhealthy or ill-maintained lawn. It may be improperly fertilized, irregularly mowed, uncultivated, or poorly watered. Therefore, you can prevent most weed invasions with the adequate lawn maintenance as well as excellent weed prevention practices. First of all, let’s take a look at the different types of weeds. There are three main types of weeds and if you’re to treat an invasion in your yard properly, you’ll first have to determine the kind of weed that’s taking over. This inspection is even more important when you’ll have to buy a chemical weed killer. Broadleaf or broad-leaved weeds are, as the name implies, the type that has leaves, whereas grassy and sedge weeds resemble grass with their blade-like foliage. Some common broadleaf weeds are dandelions, white clover, and creeping Charlie. Grassy weeds or grasses more closely resemble grass with their narrow leaves, delicate flowers, and rounded or flattened stems. Typical examples of grassy weeds are crabgrass, goose grass, and also foxtails. Otherweeds that resembles turf, albeit in tall, thin clusters areSedges. There are most often in the form of nutsedge, especially yellow nutsedge, as well as bulrushes. Ensure that your plants and your lawn are not over-watered or under-watered. You ought to take a look at some great sprinklers here. Ensure that you apply the right fertilizer, in the right amounts, and at the right times. Several mowing factors will have a direct impact on weed control and lawn health. Some of these factors are mower choice (whether it’s a z-turn or a reel mower), and most importantly, mowing at the right height for your particular grass type. Selective weed killers are herbicides that target specific types of weeds. Consequently, this type of weed killer may be useful for a particular weed, say crabgrass, but may not be work at all with creeping charlie. This classification is the reason why it’s important for you to determine the type of weeds that are “squatting” in your lawn. Non-selective weed killers, on the other hand, are typically broad-spectrum herbicides that makers formulate to work against most types of weeds, including grass. So, with non-selective weed killers, you’ll be able to spot-treat patches of weeds, decimate entire areas of unwanted grass, or both. However, due to its wide-ranging effects, you’ll need to take more care when handling these types of weed killers. Both of these weed killers may have pre or post-emergent traits or a combination of these two capacities. You can use weed killers with pre-emergent capabilities to prevent the growth of immatureweeds or saplings from progressing to maturity. On the other hand, post-emergent weed killers primarily target mature plants. Excellent weed killers can cover areas up to 25,000 square feet with just a single 1-gallon container. However, you must keep them away from direct light, and ensure that they are sealed tight, so their efficacy will keep for much longer in storage. Always, always, always thoroughly read the labels on any herbicide or weed killer you choose to use on your lawn. This way, you’ll know the proper way to use and apply this otherwise toxic chemical. Lastly, ensure that you wear protective clothing, such as goggles and nitrile rubber gloves when handling any herbicide. I personally believe that Compare-N-Save Concentrate Grass and Weed Killer is one of the most efficient non-selective broad-spectrum weed killers out there! Its 41% glyphosate mix is of professional gradestrength, but somehow this weed killer is remarkably affordable as well! This price is surprising because just 1 gallon of Compare-N-Save Concentrate and you’ll be able to cover 25,000 sq. ft! When I used Compare-N-Save Concentrate Grass and Weed Killer, it controlled and killed leaves quickly and most often, permanently! I also loved that it has to residual effect on the soil. Hence, I soon as the weeds died, I was able to replant immediately without worrying about the plant’s health! Southern Ag 2,4-D Amine Weed Killer is your answer to the most dreaded weed among gardeners and lawn maintenance: broad-leaved weeds. This weed killer will selectively kill those pesky weeds straight down to their roots. Additionally, you won’t have to worry about running out anytime soon since a 1-quart container will cover over 22,000 sq. ft. Being a selective herbicide, it has minimal risk to animals and people. Hence, as long as it has dried, it’ll be ideal for treating places with high foot (and paw) traffic such as parks, golf courses, animal pastures, and others. Southern Ag 2,4-D Amine Weed Killer comes in concentrate form, but it’s remarkably easy to reconstitute, and the instructions are easy to follow too! Despite maker’s naming 16 fl. Oz. Bonide Herbicide Concentrate as “sedgeender”, it can also control crabgrass, as well as annual and broadleaf weeds! It’s also an excellent option for residential properties since its safe for both cool-season, and warm-season grass. On cool-season grass, the Bonide Concentrate Sedge Ender will cover over 8,700 sq. ft. On the other hand, applying the herbicide on warm-season grass will cover an area of about 2,000 sq. ft. When you follow instructions correctly and apply sufficient amounts, this herbicide will quickly terminate most sedge weeds but will stay safe for your pets! Depending on the maturity of the sedges, reapplication may be necessary. Roundup Extended Control Weed and Grass Killer is one of the most potent formulas on our list! As a non-selective weed killer, Roundup Extended Control is a broad-spectrum herbicide that will work in as quickly as three hours! Additionally, it only needs around 10 minutes for it to be rainproof! A powerful herbicide requires care, so remember to be very particular about the plants you target since this weed killer will kill anything green. However, if you successfully target your unwanted weeds, Roundup Extended Control will prevent growth for up to four months! My only gripe with this weed killer would be that it covers only 800 sq. ft. This small coverage makes it quite pricey, especially if you’ll be treating a large lawn. Lastly, we have the 32 fl. Oz. Spectracide Weed Stop for Lawns plus Crabgrass Killer Concentrate. One might call this weed killer broad-spectrum as it targets over 250 types of weeds, as well as stubborn crabgrass and yellow nutsedge. However, Spectracide Weed Stop will be generally safe on lawns. For example, there might be some yellowing on affected Bermuda, but you can be sure of a quick recovery. Just remember to avoid applying anyway when outside temperatures exceed 85°F as grass damage may occur. For a list of all targeted weeds as well as some helpful instructions, you can check Spectracide’s website here. ​Ready to use out of the box with its built in sprayer. There you have it! That’s my top 6 best weed killer for lawns. I hope this article will help you get rid of those pesky weeds!